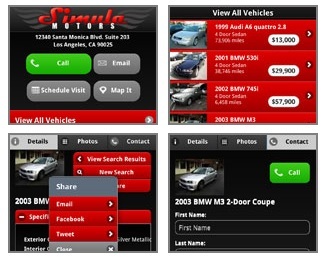 Is Your Dealership Website Mobile-Optimized? If you haven’t heard, making your dealership website accessible to mobile visitors is a big, big deal. Shoppers are rapidly taking to smartphones to do their vehicle research. By the end of 2013, Cisco predicts there will be more smartphones and tablets on Earth than people. These devices see the web differently than computers, and dealers that want to capture leads from mobile need a different approach. So last year we added mobile websites to each WebManager plan at no additional cost. These mobile websites reorganized your directions, contact info and inventory into a format that’s much easier to navigate on a touchscreen mobile device. This year, we’re going several steps further. Our new premium mobile websites add extra layers of both design and function, delivering a branded, custom experience that is especially great at maximizing your online leads. What’s different about a premium mobile site? One of the most important features is the “Share” button, exclusive to premium mobile websites. This button at the top of every vehicle listing lets viewers instantly share your vehicle via Facebook post, tweet or email with others who might be in the market to purchase. That extra attention doesn’t just have sales value, it also has SEO value. Social sharing is how search engines determine the value of a page, and over time, it can improve your search position. Premium mobile websites also pump up your social value with direct links to your dealership’s social media accounts on the home page. This is a fantastic way to get more fans and followers, and ultimately build loyalty. Of course, the most obvious upgrade with premium mobile websites is the styling. Simply put, the sites look awesome. Pictured here in black-and-red, premium websites can be developed in a variety of color schemes to match the look of a dealer’s traditional website. The sites also allow for a custom logo that viewers see on top of nearly every mobile page. Over time, this branding repetition ingrains your dealership’s name in the visitor’s head and makes it recognizable when they pass you on the road. We created this upgrade because we think the future of auto sales depends on having an especially strong mobile experience. At a $295 one-time upgrade fee, it’s an especially awesome value if you intend to keep your WebManager site up for more than a few months. Your premium site will stay premium as long as you’re our customer.